ww2dbaseIsoroku Yamamoto was born Isoroku Takano, but changed his name after being adopted by the Yamamoto family. His father was a former low-class samurai warrior. He entered the Japanese Naval Academy and graduated in 1904, and participated in the Russo-Japanese War. He was seriously injured during the Battle of Tsushima in 1905; he recovered though left with many scars. Yamamoto was nicknamed "80 sen" by some of his favorite geisha girls because he lost two fingers from the said battle (at the time, a geisha manicure cost 100 sen, or 1 yen). He was American educated (Harvard University, 1919-1921);, and became a junior naval attaché to several nations. In 1924, at age 40, he changed his specialty from gunnery to aviation, recognizing the upcoming trend in naval warfare. ww2dbaseDuring the period between 1926 and 1928, Yamamoto was the senior naval attaché to Washington DC, United States at the rank of captain. After 1928 he returned to Japan, becoming an advocate of air power, and was partly responsible for the establishment of Japanese naval air fleet. He said his farewell to his commissioned carrier, the Akagi, briefly, as a delegate to the London naval disarmament conference of 1930. At the conference he had risen to become a popular figure among the Japanese military elite. He returned to Japan and served as the head of the technical division of the Navy's Aeronautics Department, and then commander of the First Carrier Division, taking the Akagi as his command ship once again. 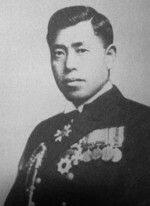 At the rank of vice admiral, Yamamoto took on the entire Aeronautics Department before becoming the Deputy Navy Minister in 1936. Due to his peaceful nature, his life was seriously threatened by warlike extremists, who at that time influenced Japanese politics greatly during this period of military and territorial expansion. Under the advice of his colleagues, he was transferred to the Combined Fleet as its Commander-in-Chief, escaping feared retribution, or even assassination, against his political views; assassinations could be called commonplace in this period in Japan. Yamamoto was promoted to the rank of full admiral in 1940 at the venerable age of 56. Despite his age, he continue to exercise regularly and keeping in excellent physical shape. ww2dbaseAway from his profession, Yamamoto was an avid gamer and gambler, enjoying Shogi (also known as Japanese chess), billiards, bridge, mah jong, poker, among other games that tested his wits and sharpened his mind. He also enjoyed calligraphy and poetry (some would criticize his poems as being monotonous). He was also known to frequent geisha houses, reflecting the fact that he was never very close with his wife, Reizo. He did, however, father four children with his wife, two sons and two daughters. Reizo revealed to the Japanese public in 1954 that Yamamoto was closer to his favorite geisha Kawai Chiyoko than to her, which stirred some controversy. I can guarantee to put up a tough fight for the first six months but I have absolutely no confidence about what would happen if it went on for two or three years.... I hope you will make every effort to avoid war with America. ww2dbaseThis wish of his would not come true; his pessimistic attitude and the inability to use his stature as the former Navy Minister and the current Commander-in-Chief of the Combined Fleet to recruit political allies to his cause. This failure ensured the rude awakening of of the power on the other side of the Pacific Ocean. The previously peaceful Treaty Faction officer who resisted a wide-scale war against multiple western nations accepted his duties from above his chain of command. He not only planned for the war that Imperial General Headquarters wanted against the United States, but he also worked to persuade others for a war against the United States in the name of duty. Going against his own belief that the US was too much to take on for Japan, Yamamoto devised an attack against key military installations in the Pacific Ocean. At the last moment, he added Pearl Harbor in the US Territory of Hawaii to the list of targets. As the attacks commenced, the US was brought into WW2. ww2dbaseIt was after the initial victories of the Pacific War that really drew out Yamamoto's manipulative style of leadership. In order to ensure that the Combined Fleet targeted objectives that he deemed important, he slowly maneuvered himself to a position where fellow admirals Osami Nagano and Shigeru Fukudome slowly ceded their authority to Yamamoto. Unable to accept criticism, Yamamoto ran the Combined Fleet with intimidation. ww2dbaseMere months after the impossibly successful victories, Yamamoto drew up the plan to attack Midway, an atoll northwest of Pearl Harbor, in order to destroy the aircraft carriers that escaped the Pearl Harbor attack. However, poor planning and less than perfect carrier doctrine ultimately led to the demise of four precious fleet carriers, including his former command ship, Akagi. Naval historian Jonathan Parshall said that "[Yamamoto's] needlessly complex operational scheme at the Battle of Midway dispersed his forces in the face of a still-dangerous foe, and directly led to the disaster there." The fact that Yamamoto accepted to take on a campaign in the Aleutian Islands at the same time as the Midway invasion reflected his failure, arrogantly underestimate the capability of the American fleet and reducing the overall effectiveness of his stab at Central Pacific. The two light carriers and 16 submarines sent to the Aleutian Islands could have changed the outcome of the Midway battle. ww2dbaseDuring the Solomon Islands campaign, Yamamoto was unable or unwilling to leverage Japanese navy's collection of big guns against the American carrier force (when he did, it was too late) and air force at Henderson Field on Guadalcanal. Despite of his contributions to the introduction airpower into the Japanese Navy, his endless pursuit of a Mahanian decisive battle with his big guns ultimately became his greatest shortcoming. Many military historians also criticized his strategies at the Solomon Islands, which "frittered away Japanese maritime strength instead of concentrating it", just like what he had done at the Battle of Midway. In addition, Yamamoto must also at least take partial blame for not preparing Japan to manufacture enough aircraft and train enough pilots to replace casualties. Japan's inability to keep the carriers occupied was a mistake that would prove to have had severe consequences later in the war. "A few more mistakes of this order," Dan van der Vat said in his book The Pacific Campaign, "Yamamoto might have come to be seen, even by the Americans, as an asset to their cause". ww2dbaseOn 14 Apr 1943, US Navy Fleet Radio Unit Pacific Fleet decoded a intercepted Japanese Navy message, which allowed the US to learn that Yamamoto was planning on an inspection of three front-line bases near Bougainville Island in the Solomon Islands. The message contained specific details regarding Yamamoto's arrival and departure times and locations, as well as the number and types of planes that will transport and accompany him on the journey. When Admiral Chester Nimitz, commander-in-chief of the US Navy Pacific Fleet, learned of this message, he decided to go ahead with striking down Yamamoto en route. If successful, his death in battle would also deal a severe blow against Japanese morale, Nimitz concluded. The final go-ahead came from the White House via Navy Secretary Frank Knox. After receiving the approval, Nimitz gave the task to Admiral William Halsey, whose forces were in the Solomon Islands area at the time. ww2dbaseIn the morning of 18 Apr, green khaki-clad Yamamoto departed Rabaul, New Britain at 0600 hours. In his hands was a sword given by his now deceased brother. He sat in the left-front seat in the passenger compartment of a G4M2 bomber, next to Chief Petty Officer Kotani. His chief of staff, Matome Ugaki, also traveled in the air convoy, but in a different G4M2 aircraft. Six A6M Zero fighters escorted the G4M aircraft. En route, they were attacked by a group of 18 US Army P-38 Lighting fighters based in Henderson Field on Guadalcanal Island. The P-38 fighters were fitted with extra large drop tanks in order to provide them enough fuel for the return trip after the strike. As the Americans attacked, the G4M2 bombers were strafed repeatedly; one of the many .50 caliber rounds fired hit Yamamoto's shoulder, while another entered his jaw on the left side of his head and exited near the temple on the right side, probably killing him instantly. 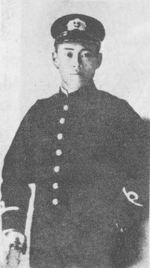 The credit for killing Yamamoto was given to Lieutenant Rex Barber, but 1st Lieutenant Thomas Lanphier, Jr. would contest it for some time to come; many historians would later disagree with Lanphier's claim. Shortly after, the G4M2 aircraft carrying Yamamoto crashed into the jungle, followed by the G4M2 aircraft that carried Ugaki, who would survive the attack. Yamamoto's body was found by Japanese search and rescue party led by Army engineer Lieutenant Hamasuna the next day in the jungle north of Buin. Hamasuna described that he found Yamamoto thrown clear of the wreckage, sitting perfectly straight under a tree, white-gloved hand grasping the hilt of his sword; it was generally thought that Yamamoto's remains were tidied up by Hamasuna and his search party into the condition that Hamasuna had described, out of respect of the admiral. ww2dbaseThe Japanese government did not announce Yamamoto's death until 21 May 1943. To cover up the fact that the Allies were reading Japanese code, American newspapers published a story that civlian coast watchers in the Solomon Islands saw Yamamoto boarding a bomber in the area. The Japanese Navy bought the story and would fail to change its communications code. ww2dbaseCaptain Watanabe and his staff cremated Yamamoto's remains at Buin, and the ashes were returned to Tokyo, Japan aboard the battleship Musashi, Yamamoto's last flagship. Yamamoto was given a full state funeral on 5 Jun, where he received, posthumously, the rank of fleet admiral and was awarded the Order of the Chrysanthemum, First Class. Part of his ashes was buried in the public cemetery in Tuma in Tokyo and the remainder at his ancestral burial grounds at the Chuko-Ji Temple in Nagaoka City. Tens of thousands of mourners came to Nagaoka City to pay their last respects. "Death of Yamamoto due to 'Magic'"
"The fate of the Empire rests on this enterprise every man must devote himself totally to the task in hand." 4 Apr 1884 Isoroku Yamamoto was born as Isoroku Takano. His surname would not change from Takano to Yamamoto until 1916 when he was adopted into the Yamamoto family. 14 Nov 1904 Isoroku Yamamoto was given the rank of midshipman. 31 Aug 1905 Isoroku Yamamoto was promoted to the rank of ensign. 28 Sep 1907 Isoroku Yamamoto was promoted to the rank of sub-lieutenant. 11 Oct 1909 Isoroku Yamamoto was promoted to the rank of lieutenant. 13 Dec 1915 Isoroku Yamamoto was promoted to the rank of lieutenant commander. 1 Dec 1919 Isoroku Yamamoto was promoted to the rank of commander. 1 Dec 1923 Isoroku Yamamoto was promoted to the rank of captain. 13 Apr 1924 Captain Isoroku Yamamoto visited the United States as a member of the Japanese delegation. Among other places, he visited the United States Naval War College. 30 Nov 1929 Isoroku Yamamoto was promoted to the rank of rear admiral. 15 Nov 1934 Isoroku Yamamoto was promoted to the rank of vice admiral. 30 Aug 1939 Isoroku Yamamoto was appointed the commander-in-chief of the Combined Fleet by Navy Minister Mitsumasa Yonai. 15 Nov 1940 Isoroku Yamamoto was promoted to the rank of admiral. 24 Dec 1941 Isoroku Yamamoto met with his top lieutenants aboard battleship Nagato. It was possibly in this meeting that he began discussing the possibility of a strike on the Americas with aircraft launched from a submarine. 9 Mar 1942 Admiral Isoroku Yamamoto issued orders to the fleet to prepare for Operation C, a raid into the Indian Ocean. 13 May 1942 Isoroku Yamamoto was granted audience with Emperor Showa, who congratulated him on the success in the Battle of Coral Sea. Knowing that the tactical victory was not as glorious as it appeared, Yamamoto was notedly ambiguous on his responses to the emperor. 18 Jan 1943 Admiral Yamamoto came aboard battleship Musashi at Truk in the Caroline Islands, which would officially become his flagship on 11 Feb 1943. 3 Apr 1943 Admiral Yamamoto and his staff departed Truk, Caroline Islands for Rabaul, New Britain on two Kawanishi H8K flying boats to supervise Operation I-GO from 7 to 14 Apr 1943, expecting to return to flagship Musashi on 19 Apr 1943. They arrived at Rabaul at 1340 hours. 4 Apr 1943 Isoroku Yamamoto and Ryunosuke Kusaka met at Rabaul, New Britain to discuss the details of the I-Go offensive. 13 Apr 1943 At Rabaul, New Britain, Admiral Isoroku Yamamoto played a game of Shogi with Vice Admiral Ryunosuke Kusaka, discussing Pacific War strategy meanwhile. 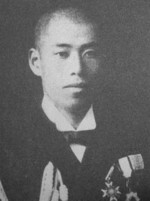 When Yamamoto spoke of his intention to personally inspect forward bases to raise morale, Rear Admiral Takatsugu Jojima and Vice Admiral Jisaburo Ozawa protested but failed to dissuade Yamamoto. Yamamoto's lieutenants were particularly worried about the fact that Yamamoto's detailed travel itinerary were sent over radio. 14 Apr 1943 US Navy Fleet Radio Unit Pacific Fleet decoded a intercepted Japanese Navy message, which allowed the US to learn that Yamamoto was planning on an inspection of three front-line bases near Bougainville Island. The decrypted message was immediately forwarded to Admiral Chester Nimitz at Pearl Harbor, US Territory of Hawaii. 18 Apr 1943 The two aircraft carrying Admiral Isoroku Yamamoto and Vice Admiral Matome Ugaki took off from Rabaul, New Britain at 0600 hours. Over the island of Bougainville in the Solomon Islands, they were shot down by American fighters over Bougainville in the Solomon Islands, killing Yamamoto. 19 Apr 1943 A search party found the remains of Isoroku Yamamoto on Bougainville, Solomon Islands. 20 Apr 1943 A medical examination was conducted on Isoroku Yamamoto's remains. 21 Apr 1943 Isoroku Yamamoto's remains were cremated at Buin, Bougainville, Solomon Islands. 23 Apr 1943 In the evening, a flying boat arrived at Truk, Caroline Islands with ashes of Yamamoto and six of his staff officers, who had been shot down in a flying boat over Bougainville five days earlier. Senior staff officer Captain Kameto Kuroshima secretly transferred Yamamoto's ashes to the admiral's sea cabin. 21 May 1943 One month after the death of Admiral Isoroku Yamamoto, who had been killed when the aircraft in which he was travelling on a tour of inspection was shot down by US fighters over Bougainville Island, the news was finally revealed to the Japanese public. At Yokosuka, Japan, senior Japanese naval officers led by the Emperor, in person, trooped aboard the battleship Musashi to pay their last respects to Yamamato. Along with the late Admiral's ashes, contained in a small white box, was a poem by the Admiral that had been found in his sea-cabin on the battleship Yamato. It began: "So many are dead, I cannot face the Emperor... soon I shall join the young dead soldiers." 23 May 1943 Battleship Musashi arrived at Kisarazu, Chiba, Japan, disembarking Isoroku Yamamoto's ashes. 4 Jun 1943 In Tokyo, Japan, Emperor Showa made a rare address about an individual regarding the loss of Isoroku Yamamoto. 5 Jun 1943 A full state funeral was given for Isoroku Yamamoto. The funeral procession slowly moved from Tokyo, Japan to Hibiya Park in nearby city of Chiyoda. At 1050 hours, many Japanese citizens across the entire country bowed their heads toward Tokyo in honor of Yamamoto. During the ceremony, Hideki Tojo made an address regarding Yamamoto's contributions to Japan, while Yamamoto was posthumously promoted to the rank of fleet admiral (or, literally, naval marshal) and was given the Order of the Chrysanthemum 1st Class and the German Knight's Cross of the Iron Cross with Oak Leaves and Swords. This site is a grate useage for my book report! it was like the only one just about Isioroku! Well thank you for the great information! Seems to me Yamamoto was growing to tired to be cautious. And his soldiers learned the art of suicide all too well. It is importent to remember that this entire operation was planned, and carried out by regular line pilots. This was not some special unit.Everyone from Capt Mitchell to the lost Roy Hine was U.S. Army Air Corps line pilots. That is the greatness of the mission. Just regular guys with a regular leader doing a phenominal job. Anyone interested in the whole story including background information on all the pilots and Yamamoto should read Lighting Strike it is all inclusive. Admiral Ugaki survived the crash of the 2nd bomber and after recuperating was put in charge of BatDiv 1. As a French historian, I prepare a conference about Admiral Yamamoto Isoroku. Admirals life is more interesting that what official history done. But i cant forget Pearl Harbor. Is there a movie about this operation that attacked and killed the monster of Pearl Harbour? This is great ^_^ my research paper will be the best. Outstanding Mission by Army Pilots flying P-38s. A winning combination all the way round. I have been reading a book on Yamamato. To me, he is a great warrior. A Japanese Hero, who fought well for his emperor. the point is Yamamoto was forced into this war which he really hated. Ive always thought what the Japanese did in WWII was interresting, and this is neat. all i know that my grand-grand father tsumetaro yamamoto is a great and good soldier.even that i see him only in picture.but my grand father tell something a story that happen b4 ww2.my grand father is genaro yamamoto.but now my grand father is dead.im looking forward to know about the yamamoto clan.i want to know more about the story of yamamoto. Well, this was a great source for my analysis of American-Japan Relations: 1919-1955 project for US History. I second Jerrys comments. Lightning Strike by Donald A. Davis is an excellent reference book that puts Yamamotos death in perspective along all those involved. yes anonymus whos aking about the pistures of yamamoto i had that all if you want i can show you but first you need to tell why your interested about the pictures of my grandfather??????????? *** Yamamoto all is fair in War, *** Coward Bastards started it America Nuke finished it..
Why did the Japanese treat non-Japanese so poorly? What they did while occupying China, and what is now Korea, the Phillipines, was beyond description. Between 13 and 12 of all POWs died - by starvation, work-to-death, or outright murder. Even today, the non-Japanese cannot trust the Japanese Nihonese. Cultures are so different, and no culture is innocent when it comes to war, but they are still in denial of their crimes. They refuse to pitch to a foreignerAmerican, who played in their professional baseball league, when he got close to passing their homerun king. I can only conclude that society is not ready to embrace the rest of the globe. Otherwise, they are a very old and proud society. It is a shame. There is so much good there as well - wisdom, beauty, order. Still, I thank God they are not yet a military power. I enjoyed your article, but I do want to point out that there are some discrepancies regarding the Alutean attack force. The reason he attacked there was because, in theory, the Americans would have split their forces, and the larger force att Midway would have an easier time because of the diversion. The fact that the Americans cracked the Japanese Military communication code led to the discovery of the Midway battle plan (the Japanese werent very good at commint), therefore nullifying the element of surprise, and resulted in most of the American ships going to Midway. Had the code not been broken, the outcome would have been more favorable to Japan. As atrotious as the attack on Pearl Harbor may be, Isoroku Yamamoto was following his orders. Of course he would do the best job he could, and thats exactly what he did. Remember, he was opposed to attacking the United States, and he was also very wary of what would come of it. So, if your orders are to do something you know will bring about dire consequences, would you not do the best damned job you could in an attempt to deafen an inevitable retaliation? I really think that you should put yourself in his place before you start saying negative things about him. I war is a stupid thing to do ,we should all get along. It is my view that Yamamoto was a hero and one of the finest examples of a soldier that any nation could look on. He did his duty, but he fought honorably and died honorably. it is great article.but include more information. let me teach you the art of war and bravery. nimitz should follow what other generals did in the past. i honored robert e. lee and william t. sherman because they decide the outcomes in the battlefield. so did wellington and napoleon. shooting at the back is a cowardly acts done by nimitz because he is afraid of battling head to head with yamamoto. Poor nimitz. well to answer anonymous #15 i have to say that the Japanese saw themselves as a superior race to others. I do have to agree with "genghis khan" that it was a very cowardly thing to do. however it was a very strategic plan in order to remove a stronger enemy. he might have been thinking of an easier way to win this war. I believe most people hated this war and in war you try to finish it as fast as possible. I'M SMARTER ! ! ! ! I have to say there is alot of negative comments about yamamoto, but how many of you have actually looked at his personal life. All he wanted was to be a husband and a father. If you talk to someone that knew him he Hated war!!! He didnt want to leave his children, or die at hat age. for *** sakes he died at about the about the age his his father was when he was born. when the task was given to him he didnt like that idea so natrually he did the best he could so there would have less error. how many americans can say that if the task was given to them that they would not fight for the country they love. in the end i would say yamamoto was a hero. ps look at what some of the american soldiers were doing to the iraq prisoners. I see a couple of comments calling Nimitz a coward but check out Yamamoto's opinion on a similar situation. On August 20th, 1939, Yamamoto became the commander of the United Fleets and its First Fleet Division. On November 11th, 1940, the celebrating conference of 2600th imperial year was held at the Double-Bridge Park in front of the Emperor's Palace. The emperor had a speech there under the bright sun. A few days later, Sorimachi who attended to the conference, talked to Yamamoto to share his impressions. Yamamoto answered, "Yes, I was invited, but I did not attend, so I cannot tell you how it was for me. It was an occasion where probably all of the government people and the emperor gathered in one place. We are at war against China. Jiang Jieshi (Chiang Kai Shek) is a great commander and he has a good Airforce power. If I were he, I would just attack the Double-Bridge Park and easily destroy Japan. Therefore, I was with the fleet watching the sky two entire days. It was nothing but luck that I did not see any airplanes coming." yamamoto understood carrier airpower, he qualified as a pilot in his 50's he also understood that if japan went to war with the u. s. he would have to win the war fast! he understood the industrail might of the u.s. japan gambled and lost. lesson learned: it took the u.s.a. 44 months to defeat little japan. we picked our own people an i picked yamamoto. My ten-year son is a WWll fanatic. He recently completed a Biography on Isoruko Yamamoto and the only question I couldn't answer was "what became of Yamamoto's two sons and two daughters?" still the article was very good. I honestly don't think Japan ever had a chance against us. Their only hope was to knock us out of the fight quickly because if it turned into a grapple, they were screwed, even though we were fighting Germany as well. He may have been fond of us, but Japan was still his country and he would serve it. But unlike many in Japan, he had been to this country and knew us. Many considered Americans weak, stupid, and cowardly. Shows what they knew. Also kind of ironic that he did not trust Germany but was the only non-German to be awarded the Knight's Cross. The only thing I would like to add to the conversation is that Kido Butai and the entire Japanese War Effort especially including the Emperor, Admirals Yamamoto, Nagumo, Kondo, Tanaka, Ozawa and many others suddenly, tonight, seemed to be a story that Shakespeare could have written. I also think of Don Quixote(The entire Japanese War effort in the Pacific)tilting at windmills. And then thinking of it also as a Greek tragedy. I think Admiral Yamamoto had a perfect ending, also, and didn't have to be around when the wheels finally fell off. Much of the JNAF’s early superiority over allied pilots can be put down to the tough pilot training instigated by Admiral Yamamoto. Whilst there were many fatal accidents in training, particularly in deck landings, the experience gained would pay dividends when it came to combat. It is said that Yamamoto once told his trainee pilots that to die in training was just as honourable as being killed in combat, but secretly kept a little black book in his tunic pocket which listed the names of all those aircrew that had been killed in training. Killing Yamamoto was really a tragic necessity and was more of a turning point than Midway for in it Japan's Navy was decapitated. He genuinely like America and Americans and deplored the idea of war. Americans found out after the war that he was really very pro-American and really bothered by Pearl Harbor. Had he survived the war he may not have been tried as a war criminal. He placed himself in peril and did what he asked his navy people to do. He went into a war zone and paid the price. He always believed he would die in the Pacific War. He left behind Reiko his wife and 4 children and the true love of his life, a geisha. He was influenced by Christian Missionaries but never became a born again Christian himself. He is the greatest Admiral since Lord Nelson. The only one that could have succeded him with as much clout was RADM Tamon Yamaguchi, a brilliant strategist who took his own life after the Midway loss. To me it sounds like Mr.Yamamoto had high respect for the Amarican navy and airforce he knew better then to underestamated his opponet. And im sure he had the right intenstion just not enough men and equipment to succesfully carry out his plans. I believe that I read a story long ago that at least one of the Admirals children were smuggled out of Japan to Manila by Marist Brother Missionaries and later taken to safety in the US. Does anyone know is that was true? This was really great for my research paper and i really enjoyed this comment about him...well thanks for the info and adive..
Its interesting reading all these comments. Admiral Yamamoto like other Japanese officers in the post WWI military were trained very well in the US by the American military. I first heard of Yamamoto when I was growing up in my village which is about a 20 minute drive to where his military transport had crashed. Yamamoto did what any true warrior would do, he fought and died for his country and his ideals. Anyone who holds that against him, is either a woman or a coward. They hit us, we hit them, that is war, do not shame the warriors who fight wars when most know nothing of the horror that they are. A great man, on par with Nap, Nim, Alex, Eis, Mac, Romm, cea, the great Military leaders of the recorded era. Names are shortened so that only those with historical backround can comprehend my thought process. Thank u all for these interesting comments. :) I am reading this article for an assignment and I believe they shouldn't have tried to kill Yamamoto because i mean: it may have been wrong but as others have said, he did it for his country, though realizing it was a horrible mistake. Bless Yamamoto's heart as well as those who were killed during the bombing at Pearl Harbor. i have an old sword . the tang has been signed "Yamamoto Large Husband". I'm trying to find out how old it is. When you study WWI, WWII, Korea, Viet Nam or any Desert War remember the information provided is frequently slanted one way. It isn't often that a historian can present a two way detailed accounting of factual data. If you chose Isoroku Yamamoto don't forget the Harvard, Smithsonian, Air and Space and separate military data bases on the subject material. I stumbled across letters that Isoroku wrote to Reiko where he wrote of the impending failure of Japan in the war. I forgot to mark the location of the material but It's under one of the aformention areas. Good Luck. guys is this really something u wanna waste ur time on ????? Being a amateur history buff of this era, I think your presentation of quick history facts of notable characters is excellent. I respect also your quick notes periodically reminding readers that much of historical events often produce conflict due to cited, or not, references of differing information not guaranteeing as actual fact in the telling. The young reader denigrating Nimitz not attacking head on was a chuckle. Too many western "gunman's walk" stories! In addition his lack that Nimitz handed (down) the attack to Halsey authority to execute the mission following the breaking of the code. I suggest the young man never served in the military, which very quickly defines chain of command. No gunman's walk in P38s nor on the ground. Tactics were worked out and practiced long before that day. Can anyone provide a list of the ribbons, medals and other decorations that Admiral Yamamto received? This guy is evil but not as evil as Hitler. I hate history so much!!!!!!!!!!!!!!!!!!!!!!!!!!!!!!!!!!!!!!!!!!!!!!!!!!!!!!!!!!!!!!!!!!!!!!!!!!!!!!!!!!!!!!!!!!!!!!!!!!!!!!!!!!!!!!!!!!!!!!!!!!!!!!!!!!!!! awesome source for my essay. Im not amazed at some of the comments made in this post. Aparently many would make a hero out of Hitler and Yamamoto. I cannot forget about the millions of people that died because of these two cowards. How can you forget that Japan allied with Germany. Yamamoto made a career out of military. He had a choices to make in life and decided to serve Japan in ther military. War is ugly. There is times when war becomes necessary to stop the killing of inocent people. Is Yamamoto a hero, "No" Not in amy since of the word. "Freedom is not Free". 73 years since Pearl Harbor and this still reads as if we are at war with Japan! Where are the sources close to Yamamoto? The best you can do is 3 Americans and a Dutch author? Have you even read "The Reluctant Admiral," by Hiroyuki Agawa? I can only imagine what would be said if there were 5 non-American authors sourced for Nimitz! As an organization proud of it's accuracy you should all be ashamed at this portrayal! He was a GREAT,GREAT man. All my resptects for this kind of people ! Thank you for the information I needed for my school report I will leave a link in my paper to give credit. agree with bill and anon "informative but bias"
"I can gaurantee to put up a tough firght for the first six months but I have absolutely no confidence about what would happen if it went on for two or three years.... I hope you will make every effort to avoid war with America. " He was correct. The battle of Midway, a short time after six months was the death knell of the Japanese Navy. The US, in the year 1944, launched more tonnage in warships than Japan had in a century. War is a meat grinder of bodies and metal; Japan had no chance against America. Ego droved the nation to suicide. I sadly don't agree with any of this. I have been told that Admiral Isoroku Yamamoto's decision to not attack the US western coastal areas just after his successful Pearl Harbor attack was due to many Americans had possession of private owned guns? But I cannot find any real documentation that Yamamoto said that anywhere? You misspelled fight, between the fourth and fifth paragraph. To anonymous of 9 Mar 2017, the misspelling has been corrected, thank you.